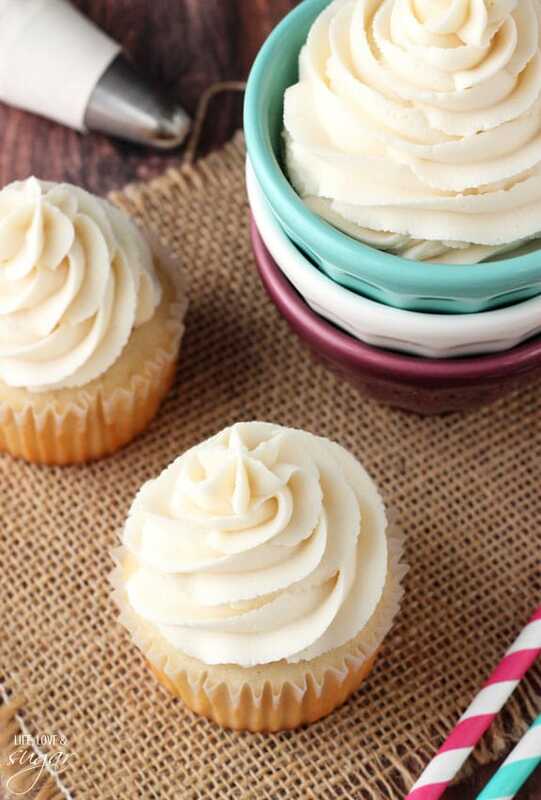 Today I’m talking all about vanilla buttercream frosting. It’s something I feel strongly about and I get some regular questions about it, so I figure why not just chat about it a bit? It’s one of the most important things to have a good basic vanilla buttercream, and I do mine a little differently than most. Let’s start a by talking a little about how I arrived at my ideal vanilla frosting. When I started making cakes about 4 years ago, I started by taking Wilton classes at a Michael’s craft store. Taking that class and having to make frosting was literally the very first time I’d made frosting from scratch. Hard to believe, right? Fact. Wilton’s recommended frosting used all shortening. It was a very sweet frosting, super thick and kind of…oily or something. Shortening can be that way. Not ideal. All shortening was out. But don’t hate on the shortening! Not yet! We are coming back to it! Knowing that I needed to have a wonderful vanilla frosting that wasn’t all shortening, I set about finding it. Remember, I was a newbie to frosting from scratch so it was a learning experience. And let me note that if you’ve never made frosting from scratch before, do not be scared of it. It is literally the easiest thing you’ll ever make. I next tried making an all butter buttercream. I had my parents and the hubs taste test the two next to each other. We agreed that while the all shortening version was too sweet and funky, the all butter was SO butter-y. Like just shy of eating a stick of the stuff. Too much for us. So what did I do? I combined them. Half shortening, half butter. Best decision ever! Using both cuts down on the butter-y taste, but not so much that you lose it completely. Using butter also makes a less stiff frosting, but still thick enough. In another break from the norm, I use salted butter. If I were to use all butter, I’d go half unsalted/half salted. With half shortening and half butter, I use all salted butter. I love the extra flavor from the salt. It also cuts down on the sweetness, since there’s naturally quite a bit of powdered sugar to thicken the frosting. The shortening is as important as the butter. On top of cutting down the butter, shortening makes a frosting that will stand up a little better in warm weather – which is a plus in the summer. I have to tell you that the combo of shortening and butter is the way to go. I regularly have people tell me how good the frosting is and they’re super surprised when I tell them it has some shortening in it. You don’t even know it’s there. The other thing people ask about is the amount of powdered sugar used. Four cups of powdered sugar is pretty standard for 1 cup of butter, or in this case a butter/shortening combo equal to 1 cup. 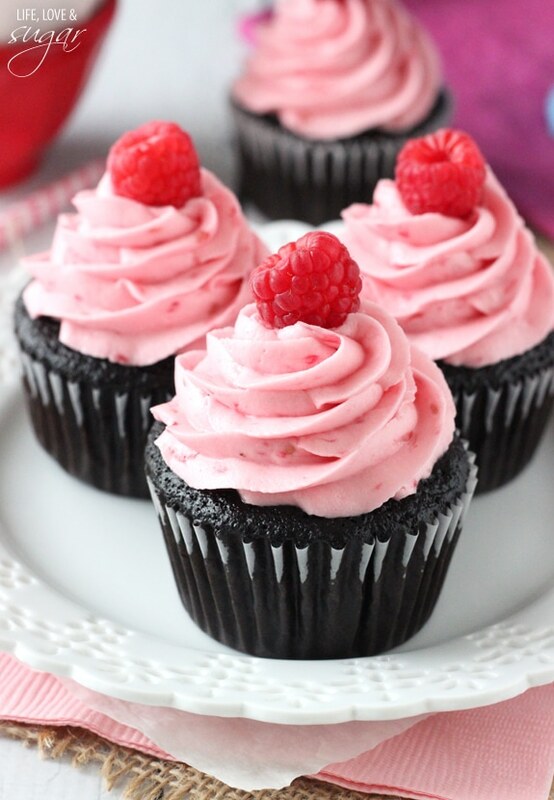 It might seem like a lot of sugar, and you can reduce it, but you will have a thinner frosting with less volume. Less volume means it won’t cover as many cupcakes, etc. so you might need more frosting. Thinner isn’t bad depending on how you will be using the frosting. Thicker stands up and holds shape better. The other quick thing I’ll note about the recipe – I mention using water or milk. The frosting will get nice and thick after adding all the powdered sugar. The additional liquid helps thin it out to your liking. You can add a little more or a little less. The amount listed is just generally what I use. You can use milk or water. Honestly, I go with water. I like to leave my cakes out (not refrigerated) so I figure water is better. And truthfully, it’s so little that nobody will notice if it’s water or milk. 1. Combine butter and shortening and mix until smooth. 2. Add 2 cups of powdered sugar and mix until smooth. 3. Add vanilla extract and 1-2 tbsp of water or cream and mix until smooth. 4. Add remaining powdered sugar and mix until smooth. 5. Add a little more water or milk until desired consistency is reached. You can add different extracts to change up the flavor. You can also add 1/4-1/2 cup of cocoa and a little more liquid to get a chocolate icing. For a peanut butter icing, add 3/4 cup of peanut butter. Your pics look like you’ve been decorating cakes your whole life, not just 4 years! That is really inspiring. I love the combo of shortening/butter. Shortening does help the icing stand firmer, but yeah, it’s missing a little something. And it does have that oily finish. Yours is so much better! Hi how long can this icing be left for? Can it also go in the freezer and reqhipped when needed? Does it even need to be frozen or can it just stay in the fridge ? It should be fine on the counter for a couple days or so, fine in the fridge for about 2 weeks and fine frozen for about a month. I hope that helps! I’m so glad you did this post!! I too did the Wilton class several years ago, and I’ve been disappointed with the icing. I also tried the all butter variations and thought it was like eating butter. 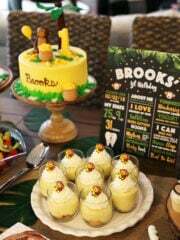 So just this past weekend, my sister had me make cupcakes for my nephew’s birthday party, and I decided to do a combo of the two, and it totally worked! I love that your post confirms what I tried!! I took a cake decorating class many years ago that was taught by a woman who had a successful cake busiess. She taught that the full shortening icing was for making roses because the stiffer texture would help the structure of the flower. Think about the last time you had a rose off a bakery cake. 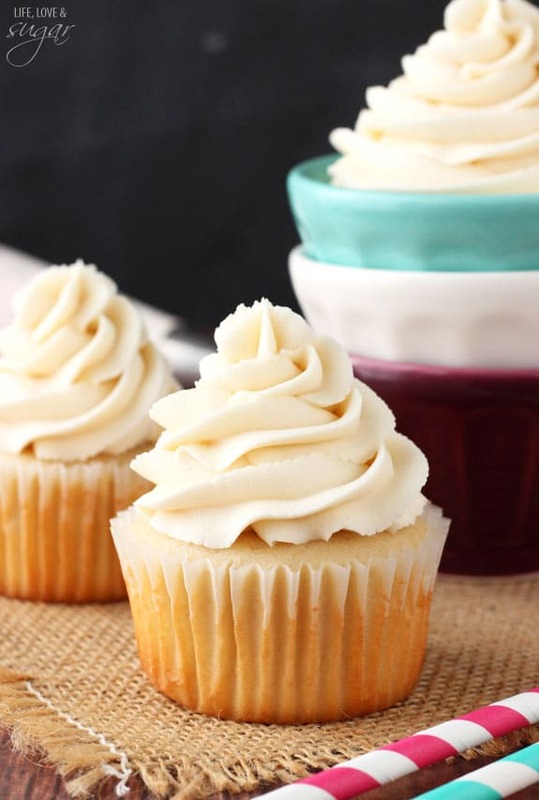 It is evident that your version of buttercream works and it is gorgeous! What size tip do you use to frost the cupcakes? Now, can you help me find a non-goopy version of cream cheese frosting? Great tip about the flowers, that makes sense. I used Ateco tip 844 for these cupcakes. Please ma, am from Nigeria I have a lot of questions to ask you about butter icing…. And I don’t know how to contact you.. Thank you so much I really enjoyed your tutorials.. I took the Wilton classes too, and learned so much! Our teacher had us just buy the tub of pre-made wilton decorating icing. This was before I started making all mine from scratch as well. Shortening does add a whole new element to the frosting! I like to add a little in my mostly-butter frosting as well. I have been looking for a buttercream icing recipe for ages! Thank you for posting it. I have a wedding cake to make for next weekend and whereas the other wedding cakes i’ve made they have just wanted chocolate ganache, this couple want the traditional fondant icing with a non traditional decorating. 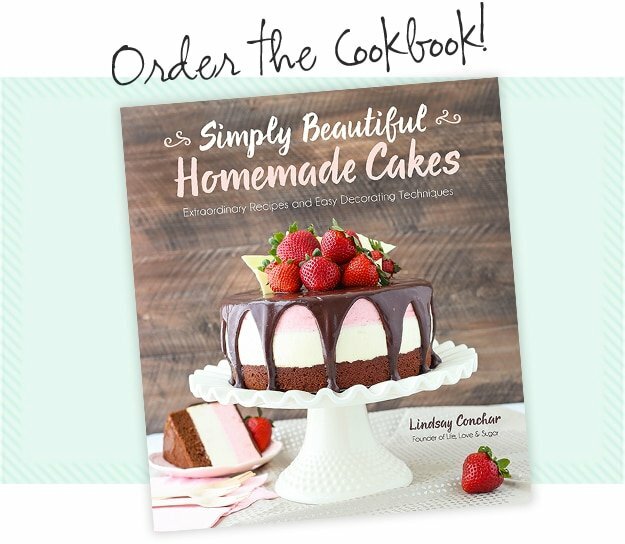 Does your buttercream set hard? Im needing a recipe for the crumb coating. Yes, this is a great crusting buttercream. Oh I love this frosting! I am now dubbing you the queen of amazing cakes! Your talent is seriously unreal. Thanks girl! 🙂 Right back at you! I’ve tried your equal parts crisco and butter and I can attest, it is really good! Want tobmake it hold up a little better in the heat? Add 2 heaping tablespoons of marshmallow creame! I took that Wilton class when I was pregnant with my first and I have to agree with you. I have been doing the half butter/half shortening for years!! It is the best and surprises everyone when they hear what is in it! Great idea! Does anyone know what shortening (vegetarian) is in the UK? It’s not margarine right? Maybe Trex? Thank you! I’m not familiar with a substitution in the UK. You can replace it with additional butter though. I add about 1 tablespoon of freshly squeezed lime juice to the icing. Gives it a total different ‘fresh’ dimension as it breaks down the sugar sweet taste. If you feel like it, perhaps next time you can give it a try. Thank you Farienne! I bet the lime juice is great with it! Did you use salted or unsalted butter? I live in Australia and we don’t really have shortening here what would be a good substitute? You can just replace it with additional butter. Yes we do have shortening in Australia…at least in Victoria. You can buy it from the specialist cake supply shops. I use 1/2, 1/2 & it always tastes delicious. I also use some white colour if the butter has made it too yellow. I just read on line that shortening in our Australia is Copha. Leave it out to soften & beat the butter 125grams & Copha 125grams really well before adding the sugar (pure icing sugar if possible not icing mixture if you want it firm & your climate is hot) . Add 1 tsp vanilla extract, 4 cups pure icing sugar added 1 cup at a time & beat well. If too thick add a little water. Hi Lindsay! Love love love your blog! I wonder if I could substitute the milk with baileys, I want to make a baileys buttercream from your vanilla buttercream recipe. Hope you can help. Yes, definitely! The Baileys would work great! 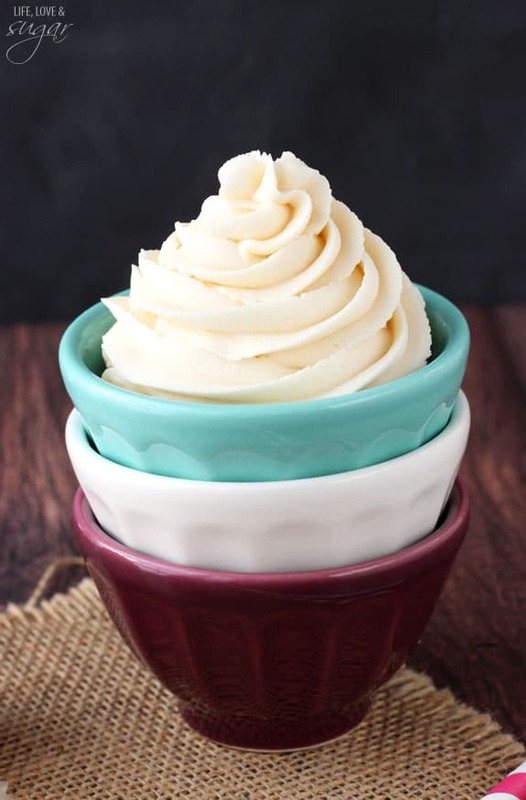 I invite you to try my French Buttercream Frosting. I found it in a cook book in the mic 70’s, written by a gal who had a deli in NYC. It has fabulous recipes, some of which I’ve won Blue Ribbons with. I like to make lemon frosting with lemon extract and lemon zest; orange with orange extract and orange zest, or any flavor you want. Tint with color if desired. Do you ever make this frosting ahead of time and put it in the fridge? If so how does it hold up, or is it best made the day you are frosting. Yes, it works great refrigerated. Just let it come back to room temperature for frosting. I live in Scotland, please can you tell me what ‘shortening’ is? Shortening is a fat made from vegetables, and you can basically use it as a substitute for butter anywhere. About how much frosting does this make? I have to make 2 – 6″ smash cakes for my nepews…would I need to double it? I ca not wait to try this. However, for some reason I cant find the actual recipe. Im on my phone so maybe that’s the problem though. your blog is amazing. The recipe is displaying fine for me. I made some updates to the blog earlier today, so you may need to clear your browser cache. I went into the recipe and tried to make a couple updates as well, so if it still isn’t working I’d suggest clearing the browser cache. Hi, wondering how you get the butter and shortening to blend together with out clumps? Make sure they’re at room temperature and beat them together well. If there are still some little clumps, they’ll smooth out as you start adding the powdered sugar. I don’t use high-ratio, I just use regular vegetable shortening from Crisco. What is “shortening”, never heard of this in uk. Is it a form of lard(animal fat) or margarine? It’s a fat that is often used as a butter replacement. If you don’t have it in the UK, you can replace it with additional butter. Going to try this receipe. I have always used all shortening because I want a white icing and butter makes it off white. Is the half and half usually white and do you have to refrigerate after frosting? It’s not going to be as pure of a white with salted butter since it’s a bit yellow in color normally. You could try unsalted butter though. Unsalted is usually more white. Personally I prefer the tradeoff with half and half. Better flavor and texture. I do not refrigerate the half and half buttercream. I used your recipe and made my first buttercream frosting yesterday. This frosting tastes like my favorite wedding cake frosting! I frosted a lamb cake for my 2 year old’s birthday and it came out delicious and lovely (especially considering I bought my first decorating tips for this project). I am going to use this recipe every time I need buttercream. Thank you very much! Awesome! I’m so glad you were happy with it! Amazing recipe! Thank you so much! I made a cake with it today and I couldn’t believe how smooth it was! And the flavor was amazing! Next thing I will be trying is your trick to making a smooth cake (which is what actually brought me to your blog in the first place). I’ve done a lot of self teaching/experimenting with cake decorating. I was wondering how you make your crumb coating (I believe thats what you called it)? I’m not much into blogging however this may be one blog I come back to often. I’ve enjoyed reading some of your blogs and am encouraged to hear of your faith in the Lord! We have so much hope in Him! Thank you again for the recipe! Thanks Stefanie! I’m glad you enjoyed it! The crumb coating is really just a light layer of frosting that’s added to the cake to seal in crumbs. I use the same frosting, just add a thin layer before adding the full layer. Hello! I am very new to baking and find that the taste of powdered sugar in frosting is chalky. I have not attempted this recipe yet, but is there another sweetener I can use? I suspect you need powdered sugar for stiffness. Hmm, I’m not sure. The powdered sugar is definitely for stiffness and volume. I’m sure there are recipes that use less powdered sugar but I think most, if not all, will use at least some powdered sugar. Regular sugar would be quite grainy. I love your blog and tips!! 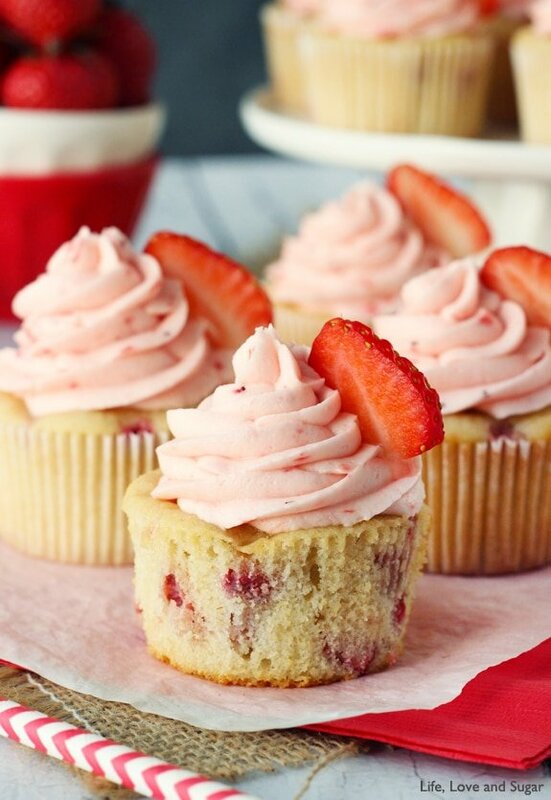 Just curious to know the trick(s) for adding fresh fruit to give a hint of flavour so that the icing doesn’t lose it’s consistency – i.e. 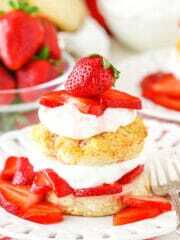 : strawberry or raspberry? I loved seeing the fruit icing in your pictures. Also, I have never tried vanilla bean instead of extract. Do you recommend this, if so, how would I replace the extract? Adding fruit can be tricky because it’ll thin out the frosting. I’d recommend pureeing the fruit, then straining it to remove the seeds. If you find you can get a strong enough flavor just adding the puree, do that. Otherwise, maybe cook the puree a bit to reduce it and make the flavor more concentrated, then add it. With the vanilla bean, I typically do a 1-1 replacement, but you could add a little more extract if you like. I recently made a strawberry frosting for cupcakes and cake for my daughter’s first birthday – it turned out fantastic. I took Lindsay’s recipe and instead of adding water, milk or vanilla I added pureed frozen strawberries (about 8 tbsp I think). I didn’t strain them or anything, just pureed in my bullet. I did end up adding water at the end to make it the right consistency for my liking. But it tasted great and people raved about it! I have to say the half/half frosting recipe has changed the way I make frosting for life! Hello I want to make a cake for my sister’s baby shower that is professional and smooth. I want to make icing, but I don’t have a stand alone mixter. Is there another way to mix this and still get smooth icing? Do you have a hand mixer? That would work just as well as a stand mixer. Hi, I live in the UK can you tell me what shortening is? Is there anything I can use to replace it if it’s not available here? Shortening is basically a butter replacement that holds up better in warmer weather. If you don’t have it available, you can just use all butter. one question about your frosting. Can I freeze it? Let’s say I make cupcakes in advance and I want to freeze them with the decoration. Will the frosting (when I defreeze them) make little drops of water? I’d suggest defrosting the frosted cupcakes in the fridge. The condensation shouldn’t be so much of an issue that way. I made a small amount of this, just to try it out with only butter since I didn’t have shortening on hand and it was too sweet for me. Does using half shortening take away some of the sweetness? No, that wouldn’t bring down the sweetness. You can add less powdered sugar, it’ll just reduce the volume of frosting (the yield). How many cupcakes, or what size cake will this recipe cover? It should cover 12 cupcakes. I usually double or triple it for a full sized 8 or 9 inch cake. 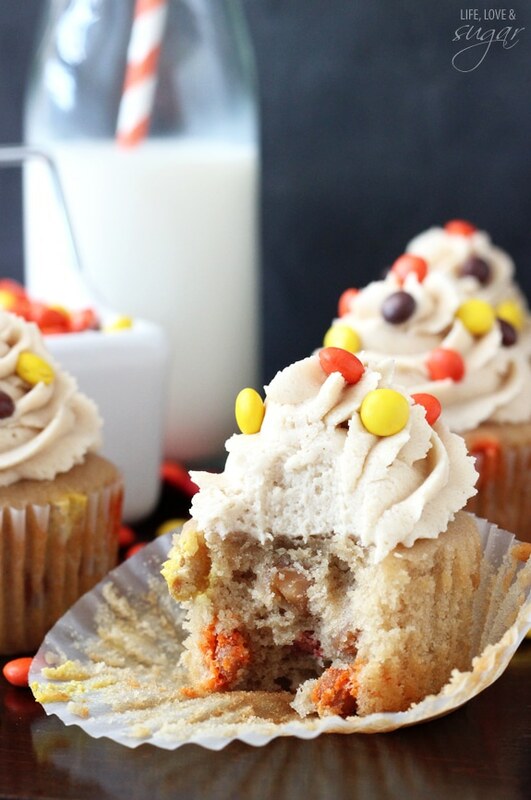 How would you suggest adding color to the frosting? I purchased some gel coloring and need to get the frosting a bright red, and I am worried that adding so much color to a white frosting will affect the consistency? If you have any tips they would be greatly appreciated! I usually add small amounts of the gel color at a time using a toothpick. You don’t want to reuse the toothpick and get frosting in your gel. The gel is quite concentrated, so it shouldn’t really affect the frosting. The darker the shade of a color, the more gel you use, but even so, it should be fine. You could always add a little less milk or water to start when you make the frosting, then thin it out after you’ve colored it, if needed. 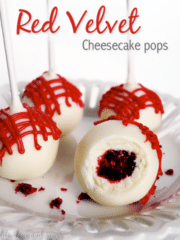 If you are making red frosting, there’s a gel red called “no taste red” that’s a good option. Because you’ll use so much gel to get a true red, it can help make sure you don’t get a funny taste. Hi, I just stumbled onto your blog from Pinterest, trying to refresh my memory on cake decorating (it’s been a while! ), and tell you, beautiful work! 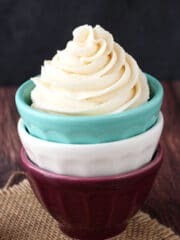 I have been using a recipe for buttercream from a professional decorator for years, and would like to share a tip she uses to stabilize her frosting. Use hot water and powdered coffee creamer in equal parts in place of the liquid in the recipe. 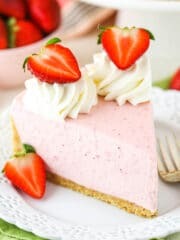 She streams the liquid in at the beginning of her recipe, with the shortening, but you could let it cool and add as needed into any buttercream recipe as needed. This gives the creaminess of milk, bit is more stable and heat tolerant. It makes a great, creamy frosting! I love that idea! Can’t wait to try it! Thanks Kelly! 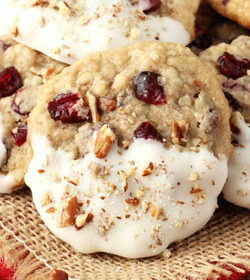 I use the Wilton recipe that asks for shortening. I notice that the frosting on my cakes will at times start to fall off. I researched this and it stated it was the shortening. Will this recipe stop that from happening if I mix half Crisco and half butter? I am Scared of you, But LOVE LOVE LOVE your cakes and your Web site. Do you freeze your cakes before smoothing with paper towel? I don’t. The frosting will actually develop a little crust on the outside if it sits for too long and you won’t be able to smooth it anymore without getting cracks in the “crust”. You want to do it right away. Hi Lindsay. I want to know how sweet is your buttercream frosting. I want to make a buttercream that people will want to eat and not scrape away like most store-bought cakes. They are way toooooo sweet. Please reply. Thank you. how would I make coffee buttercream with this recipe ? There are a couple options – one would be to add dry powdered coffee, another would be to add actual coffee or espresso. I often dissolve powdered espresso or coffee in a small amount of water so that it’s more concentrated and then I can add the flavor to the frosting without adding too much liquid. I have some coffee flavored frosting on this cake, if you’d like to take a look for guidance. Hi Lindsay. I thought I’d post a comment that someone may find useful. Most people complain about how sweet buttercream is (especially if it’s a crusting buttercream). I read somewhere to put a wee bit of lemon extract in the mix. I tried it last time and I have to say it is the very best “holy cow good” frosting I’ve ever made. The lemon flavor is barely discernible, kind of like the tang of cheesecake, but it balances out the sweet. I’m sorry to say I didn’t measure but my guess is somewhere between 1/3-1/2 tsp. I am Very New to making buttercream icing, and want to make yours. I wanted to know what type of shortening do you use? I know they make all veg & 1 that has meat fat in it. I am making 2 cakes ( each are full size sheet cakes ) and about 50 cupcakes, for my granddaughters graduation. We like a good amount of icing so knowing that how much icing do you think I would have to make to have enough? Thank You So Much! I use regular vegetable shortening, not the butter flavored one. 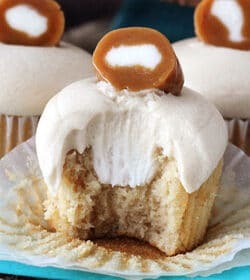 I don’t really make any sheet cakes, so I’m not as sure about those, but I use this full recipe for about 12-15 cupcakes and that’s with a good bit of frosting on each. I hope that helps! I have enjoyed reading all the questions and your answers . I’m wondering if you sift the powdered sugar before using it in the icing recipe? I do not usually. But if you have a powdered sugar that is kind of lumpy or has been sitting a while, you might want to. I just wanted to know how far in advance this frosting can be made and how it should be stored? Thanks so much! It can be make a week or so ahead and left in the fridge. It could also be frozen for up to a month. My daughter is taking a cake decorating class and will be needing to decorate a cake for the county fair with 4H. They will not need to taste the cake or the frosting at all. Would using all shortening frosting be ok with the paper towel smoothing? Yes, you should be able to use the paper towel method with an all shortening frosting. Hello. How many cupcakes will I be able to frost with this recipe? Depends on how much frosting you like on your cupcakes. 🙂 If you frost cupcakes like you see in my photos (a good bit of frosting), then it should cover about a dozen cupcakes. If you use a little less frosting, it could cover more. Thanks for the recipe. I’m Iin Nigeria. Will cisco be ok to use as the shortening? Do you mean crisco? If so, yes. I thought I posted a question but don’t see it on the board. What I wanted to ask was what kind of frosting consistency I should use to pipe the side of a cake. I plan to make a smash cake so I want to cover the entire cake with pipping frosting. Have you seen this post? You might find it helpful. I would use something thick, but still sticky since you’ll want it to be able to hold onto the sides of the cake. Something more like a cupcake consistency or the thinner consistency I show in that post would probably be best. Thank you for getting back to me! That post is really helpful. Seen lots of UK posts regarding shortening. I use Trex which is a white vegetarian fat, widely available in supermarkets here in the UK Thanks for a great recipe Lindsay. 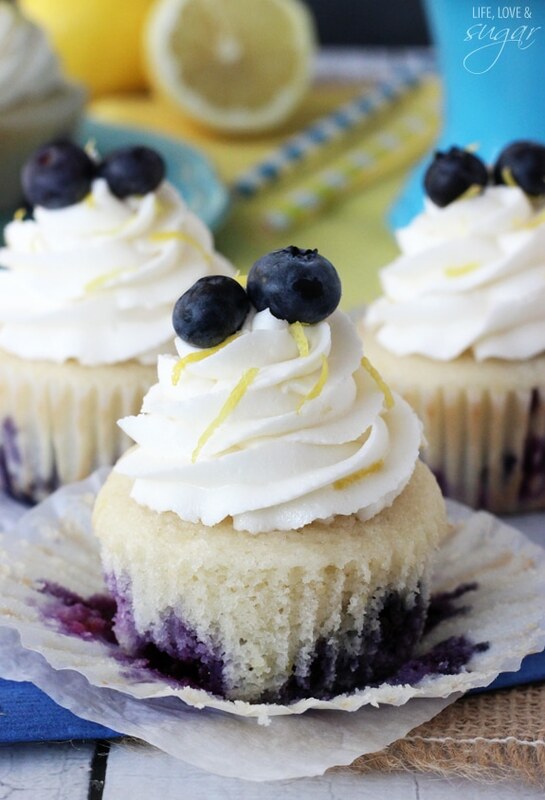 Hi there..I love all that you do…one question…sometimes all butter buttercream tastes grainy to me…probably due to the powdered sugar not fully disolving..where as swiss or italian meringue buttercream never does…by using half butter half shortening do you ever get a grainy texture? I’ve never noticed a grainy texture either way. You could try sifting the powdered sugar. Can you taste the shortening in the icing? I really think that depends on the person and how sensitive you are to the taste of it. I would say no. I’ve never had anyone who ate my cupcakes ever comment on it. If anything people tell me how great the frosting is. That said, some people who have made the frosting and really can’t stand shortening do notice it. Omg lindsay,i tried using shortening for the first time,for my buttercream icing and i am never going back???? i was so sceptical at first but it was amazing,gave me the texture ive been looking for all along( although i still used butter just like you suggested) and it didnt affect the sweet creamy taste whatsoever??? ?…thank you! I def prefer this to just butter.Love from Nigeria! So .. this is a silly question and pardon my very amateur baker mind lol But will this be a good icing for a layered cake and then smooth ( perfectly smooth) outer layer of a cake. Yes, I use it that way. Here is my tutorial for frosting a smooth cake with this frosting. I hope you’re still taking questions. I am a fan of your recipes, have never written before. I’m puzzled why the recipe doesn’t tell how much frosting is produced (in cups and grams). I often have to adjust quantities to to suit a specific purpose and it is SO helpful to know ho w much is produced with the recipe. I had a hard time with crumbs. I did a crumb coat, but the crumbs came off from that. I felt like the frosting was too stiff, and kept grabbing the underneath layer. Should I have added more water? Yes, it sounds like the frosting was a little thick. More water or milk would help with that. How long can the frosting be left out once the cake is frosted? If using the butter/shortening combination, I often leave them out for 3-4 days. If using all butter, I refrigerate. I’m not familiar with another shortening option. If you’d prefer not to use it, you can always substitute additional butter. Hi Lindsay! Love your tutorials and I’m going to give it a whirl for my own birthday cake next week. I plan on doing a 3- layered 9” Cake. How much of this recipe would I need? Also, can I make this frosting the night before and leave it out? Thank you! I’m glad you enjoy them! How much you need might depend a little on how much frosting you like. I’d suggest 3 or 4 recipes worth. Those three are all usually the same thing. It’s all very light and white. Hi Lindsey, just had a question about the amount of frosting this recipe makes. I have read through the comments/replies and I see that it will frost approx. 12-15 cupcakes and that you recommend to triple (or quadruple) the recipe to make a 3 layered, 9″ cake. So if I do a layer cake (8″ or 9″) would double the recipe be enough? Thank you for all the great recipes! It depends a bit on how heavy you like to frost your cakes. If you’re frosting the cake similar to how I do in my tutorial, I might do 2 1/2 recipes worth. If not, and you don’t like to use a large amount of frosting, you could get away with 1 1/2 or 2 recipes worth. I hope that helps! One thing would be to add a touch more salt. You could also cut back on the amount of powdered sugar, but you’d end up with less volume, so you’d probably want to increase everything else a bit to adjust for it. Here’s a post on the frosting consistency that could be helpful, if you want to make adjustments. can you use fondant icing sugar instead of normal icing sugar for extra stiffness? 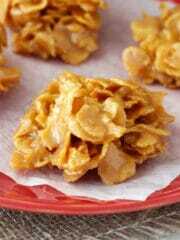 or would this not be good as a filling? i struggle to get a smooth cake and don’t always want to cover with fondant. I’m not sure what fondant icing sugar you’re referring to. I need to ice a medium 3 layer cake (25 people) should I double this recipe to get enough? Depending on how much frosting you like to use, I’d double or triple it. I *love* your recipes and this frosting is no exception! I made a test batch of this for some galaxy cupcakes I am making for my daughter’s upcoming birthday. My question is, I would like to make the icing and possibly cupcakes in advance but I’m not sure how I should go about staggering that? I need to make 6x this amount and will need to dye it four different colors. Could I dye the icing and leave it out at room temperature and ice the cupcakes the next day? I would use the 50/50 butter/shortening and use water not milk. Could I ice the cupcakes and leave them out overnight in a cupcake carrier the day before the party? Hi Lindsay, What’s your take on using a 50/50 mix of butter flavored shortening and butter? Have you (or any of your subscribers that you know of) tried using butter flavored shortening? I personally don’t love the flavor of butter flavored shortening, but that would probably be a preference thing. You could certainly try it. I usually just used canned frosting, but the one I had tasted rather sour so I thought it time to actually make my own. Of course, I thought of this recipe. I made the mistake of using unsalted butter which is all I had on hand, so it came out way too sweet, unfortunately. I still used it to frost my cake because I didn’t want it going to waste. Luckily, on the cake, it tastes slightly less sweet, so it didn’t ruin it. How much salt should I add if I don’t have salted butter on hand if there’s a next time? I’d try adding about 1/4 teaspoon and then you could add a tad more, if you feel like you need it. about how many pounds would you say this makes? I really don’t know. I haven’t ever measured it by weight. 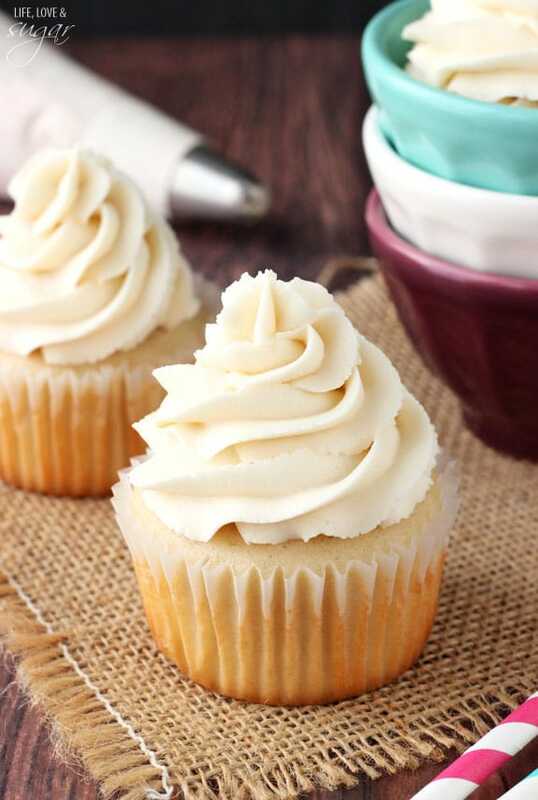 I have tried this recipe two times now, Both times the taste was wonderful but the frosting reminded me more of a whipped frosting instead of a buttercream. Am I maybe mixing it on a higher speed than i should??? It sounds like that’s a possibility. Whipping it on high speed would have that effect. I usually mix on more of a medium to medium-low speed. I’m waiting for my butter to get to room temperature and I’ll be making this buttercream recipe. What will this recipe yield or how much cake will this recipe icing? I’m making cupcakes, 6″ and 8″ cakes. One more important question, what type and/or brand of shortening do you use? in my attempt of finding the perfect buttercream icing, all shortenings are NOT created equal. I use crisco vegetable shortening. As for how much this frosting covers – I usually cover 12-ish cupcakes with it. It depends a little on how much frosting you top your cupcakes with though. And how you’re decorating them. 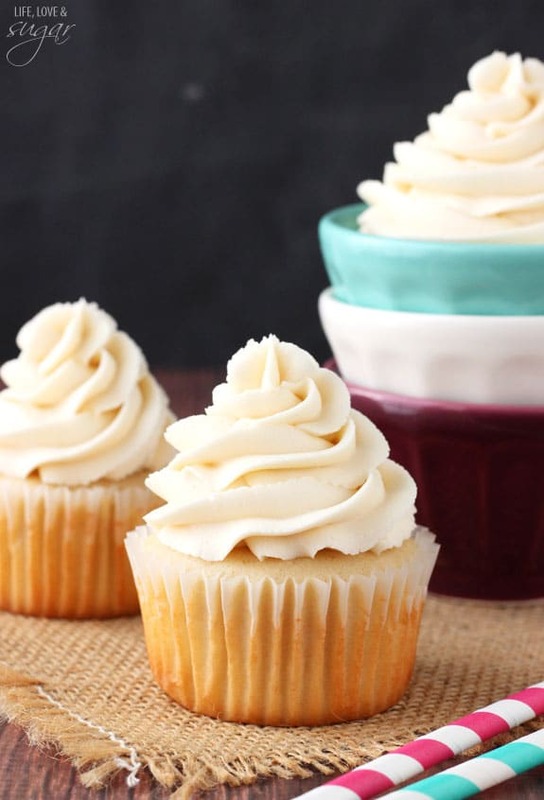 Certain frosting tips and methods use more or less frosting. 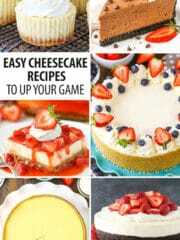 For cakes – I usually do about 2 1/2 recipes worth for an 8 inch cake, but I’m a little heavy handed with frosting so again, it depends on how much you like to use and what kind of decorations you’ll add. Hi there, should I use a room temperature or cold butter? I just decorated a girlies cake using this recipe. This is the best I have tried in my years of baking. Thank you so much for sharing. Awesome! I’m so glad you enjoyed! How would you turn this into white chocolate buttercream? 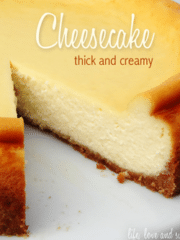 Just add melted white chocolate? 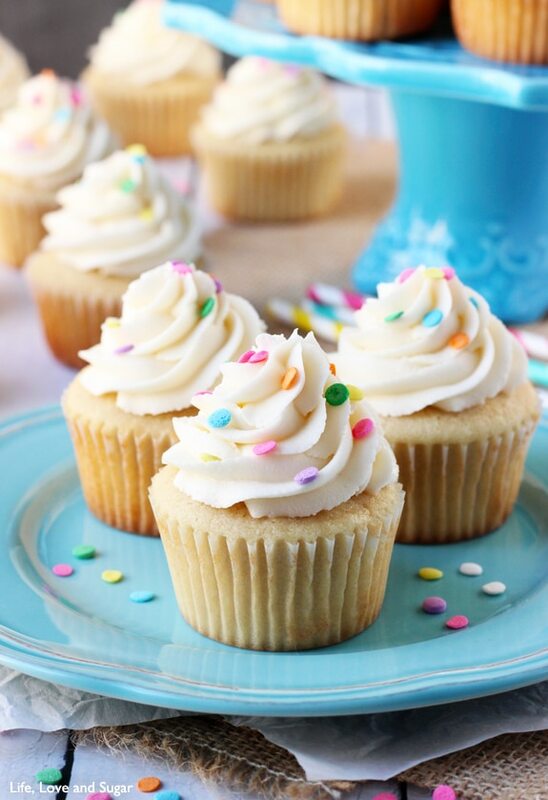 If you’d like a white chocolate buttercream, I’d suggest the frosting on these cupcakes, but with white chocolate. Perfect thank you for the detailed explanation! Can I use this recipe on sugar cookies? You can. It’s a crusting buttercream, so it will firm up a bit, but won’t be as firm as royal icing. 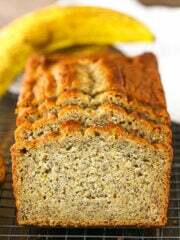 Just tried your recipe today and I would say the taste is not that bad although I preferred all butter. Followed to the T but end result is grainy no matter how long I beat. May I know where goes wrong. I have tried many others and still face the same issue where the texture is grainy. Seek your expertise on this. Hard to say without being there. 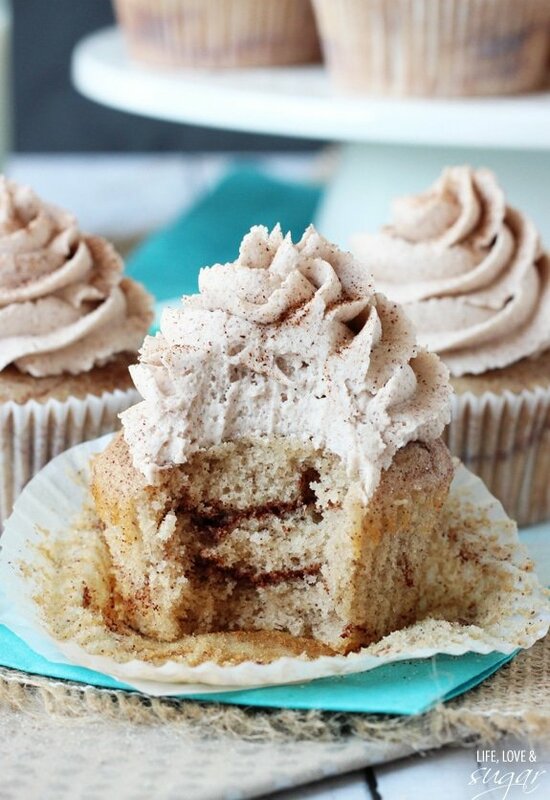 The only thing that could add any texture to the frosting is the powdered sugar. Is it fresh and free of clumpy-ness before you add it? It sounds like something to do with the powdered sugar. Also, be sure you’re using powdered/icing sugar and not granulated sugar. Can this recipe be smoothed for a wedding cake? Yes, it can be. See my tutorial for frosting a smooth cake, which uses this frosting. It should be fine for a semi-naked cake. I’ve used it before without a problem. Just be sure to finish smoothing out and touching up the frosting before letting it sit, because then the crust forms. Thanks Lindsay for the response. I did it before the response. It worked out perfectly. Very different texture from just the good ole butter and icing sugar, but adding the shortening (copha) it definitely added that different element to a standard buttercream. A win being a lot whiter than using just butter. My copha wasn’t soft enough so did take along time to beat into the butter. I wonder if melting the copha down and beating it into the butter would be easier or more effective? But overall my review is 5 stars. I use half and half unsalted and salted butter and bit of water as you said, I was a bit worried but it did all cone together eventually. I agree with the crust when left, Christmas day was a bit of a made house so I had to keep walking away from the cake and that made things difficult and I am a perfectionist but I dipped a knife into hot water and that helped soften and make the buttercream movable in bits I needed to fix. I had the cake on the bench all day, in Australia weather and surprisingly it held up and no melting or anything. You could touch it and no buttercream will go on the fingers. I was impressed. I’m glad it turned out well for you! As for melting down the copha, I don’t know about that. It would thin out the frosting a lot. If you refrigerated it so that it thickened back up, maybe it’d be ok, but I’m not sure. I’m excited to try this recipe. Is it firm enough to pipe flowers? I’m making a layered rosette cake. Thank you! Definitely firm enough. Check out my post on frosting consistency too, if you’d like. Hello Lindsey, just found your video on YouTube and came to check out your page. Excited to try the recipe. If I want to make the buttercream in bulk. What is the Ratio to use? 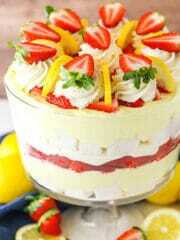 Take for example I want to make the buttercream that can frost a two tiered cake. Thank you. Will definitely try it and let you know how it came out. A little skeptical of using shortening. This is the recipe I start with and just adjust as needed. It’s hard to say how much you’ll need for a two tiered cake – what size are the two tiers? How tall? Are you using buttercream between the layers, or some other filling? How many layers are in each cake? All those things affect the amount of frosting you need. This recipe is enough to generously frost 12 cupcakes. I usually double it or do 2 1/2 recipes worth for an 8 inch cake with 3 layers inside, so maybe that can help as a guide. If you aren’t a fan of shortening, you can use all butter. You’ll still be able to use the smooth frosting tutorial method. But you will need to refrigerate the frosting if it’s going to sit out for more than about 12 hours. It’s not as stable as when you use some shortening in it. I was wondering if you leave out the merengue powder? I know in the Wilton buttercream, they use it to give stability. Does it not need it? No, this buttercream doesn’t need meringue powder. If you were to add the cocoa powder or peanut butter to the frosting would the frosting still crust like it does? what about if you add cream cheese? Yes, it would still crust. Same for the cream cheese. 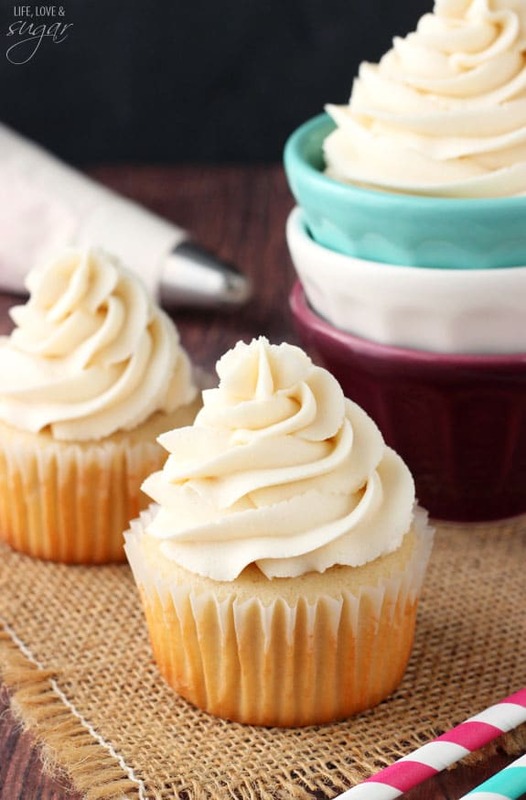 If you’d like a cream cheese frosting recipe, you can find that here. So you only use shortening for flavoring purposes, not for crusting? And why don’t you use shortening for the cream cheese version? More for consistency purposes, but in part for flavoring. Though I will admit that butter has grown on me recently. 🙂 I believe the buttercream would crust with all butter as well. As for the cream cheese version, it’s a totally different frosting for me. I much prefer the flavor of it as is (no need to adjust for that reason) and as for consistency, I have no expectations of cream cheese frosting being nearly as stable as vanilla buttercream. You could certainly use shortening to help, if you wanted more stability, but you do sacrifice flavor. Plus, I always refrigerate cream cheese frosting, where as with vanilla buttercream, I mostly don’t.